Child Protection and Welfare practitioners have identified the need for a clearer understanding of how their roles and responsibilities fit into the current Legal Framework. In response to this, Mason Hayes and Curran Solicitors in collaboration with the School of Social Work and Social Policy, Trinity College Dublin have developed a four part online Legal Training course for Child Protection Practitioners. The online course will be delivered over a four week period from the where learning materials are released each Monday and can be accessed by participants at a time convenient to them. These materials include videos, case examples, case law and topics for consideration / discussion. The course will also consider the implications of new child protection legislation such as the Children and Family Relationships Act 2015 and the Children First Act 2015. Participation in the course does not include access to Trinity Library or other Trinity College student services. Links to relevant documents will be provided in course material. There is no formal assessment for this course. However, students must engage with all online learning materials provided before a certificate of completion is achieved valued at 20 CPD points. The course involves four weekly online sessions, five hours per week. Next intake April 1st 2019. 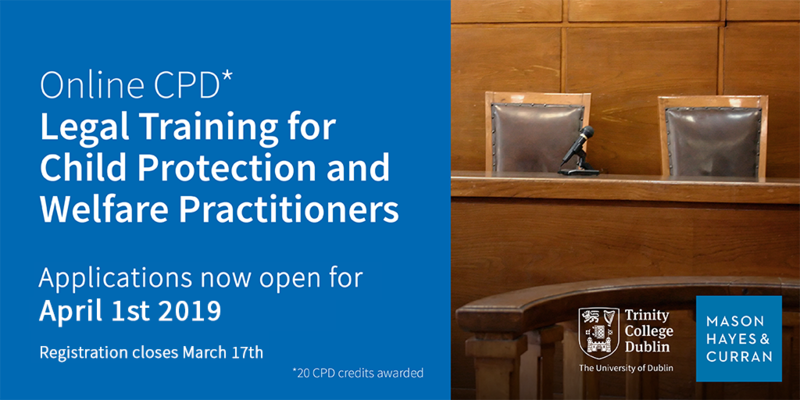 This online continuous professional development course is open to Allied Health Professionals within the scope of Child Protection and Welfare. This includes (but is not limited to) Social Workers, Social Care Workers, Family Support Workers and Public Health Nurses. Payment for the programme can be made via PayPal at the link below. Registration details facilitating access to the online module will be provided by Trinity College one week prior to the commencement of the course (subject to payment in full).